As the Reels Turn 2 is Rival’s sequel to the hit game As the Reels Turn. Like its predecessor, the second iteration is also an interactive iSlot game, and it too makes use of five colorful reels and fifteen paylines, but this time the graphics are better, the story is deeper, and you don’t have to download any software. Although introductory scenes re-acquaint the player with some of the original cast members such as Vanessa, Danny and Rex, this time around the player’s fate unravels a new tale, with all new characters, although players will have a little help from their old friend, Ivan the Fish. Game play is quite similar to that of the original game. 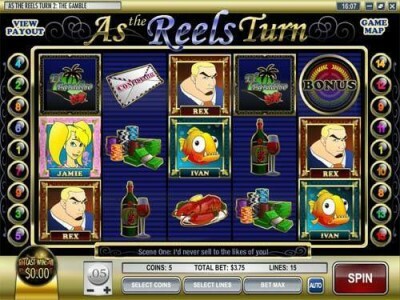 As in the first game, in As the Reels Turn 2 timid players can bet as little one cent (for a chance at a payout of ten dollars) or as much as $2.50 across all fifteen pay lines (for a total of $37.50 and a chance at a payout of $2,500). As before, savvy players will make use of all available pay lines, since the game uses them during your free spins and this will increase your chances of winning! If you liked As the Reels Turn, you’ll love the follow-up; just make sure to bring Lady Luck with you!